If you have ever had plants at home you probably have suffered the attack of these small suckers, capable of destroying a healthy plant in a matter of weeks if the necessary measures are not taken. And although there are many measures to alleviate their effect or eliminate these hemiptera, which I will also mention sideways, today we will focus on one of our protagonists. Because we have a close and voracious ally that will help us fight these small and annoying bugs in a natural way. -. Approximately 3 millimeters long, they usually attack our plants between Spring and Summer. -. They feed by stinging the plants and sucking their precious sap and not only do they dry out the plant and prevent its photosynthesis, but also transmit a virus to every plant they bite. -. The winged females are responsible for transmitting the plague to nearby plants and its reproduction is exponential, since females can give birth to new females without the need for males to fecundate, and these newborn babies are already perfectly formed (they do not lay eggs). -. 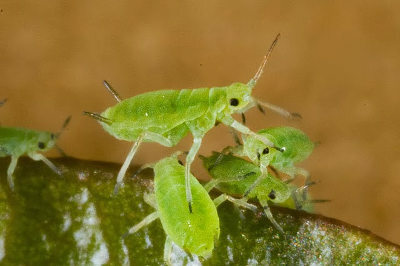 There are about 500 species of aphid, among them the green aphid, as in the image. -. All of their species have a predilection for newer and tender shoots, although, depending on the species, some focus only on one type of plant and others have a wider range. And finally, here I formally introduce you to our colorful little garden heroine: a coleoptera of the Coccinellidae family. 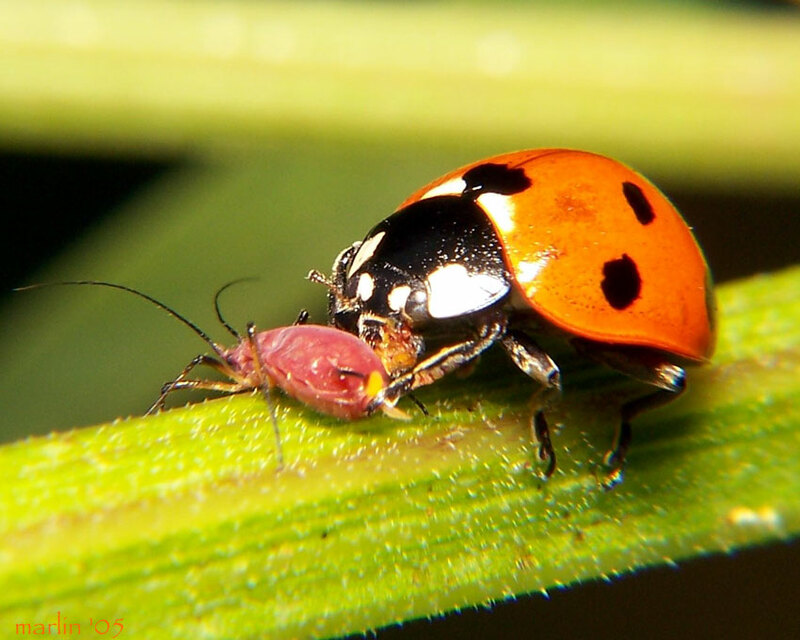 Our friends have precisely the instinct to lay their eggs near colonies of aphids and, because of being winged, they can also follow the winged aphid females to any other plant to also create another anti-aphid settlement there. One week after laying the eggs, the larvae of the ladybugs hatch; said larvae are capable of eating between 50 and 150 aphids per day. A figure not negligible although, if we consider that a single female aphid can create, throughout its life, a million aphids, it does not seem so much to us, does it? These larvae pass through 4 different states before forming the chrysalis to become a ladybug. The adult ladybug has an average life of 1 year and predates about 80 aphids per day, a figure that is not bad either. In the absence of aphids, our colorful heroines can temporarily feed on nectar of flowers and pollen, so we want to have some kind of flowers in our garden to attract them and keep them nearby. 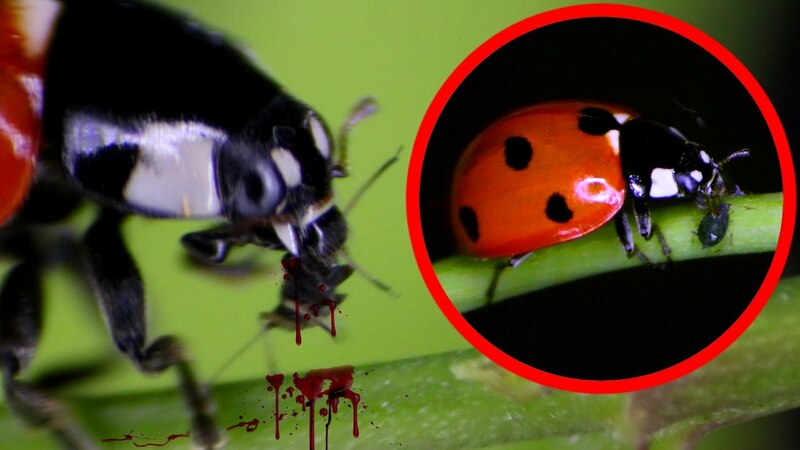 And speaking of predators, our red friends also have their own predators, such as birds, frogs, wasps, spiders and dragonflies, although it seems that one of the natural defenses of our ladybug is its bad taste in the mouth of those who eat them. -. Spray the affected parts with water under pressure; remember that the sooner you act on the colony, the easier it will be to finish them off. -. Potassium soap at 2% every two weeks and with a minimum of 3 applications. -. Neem oil, an ecological alternative that also fights other types of pests apart from the aphid. -. 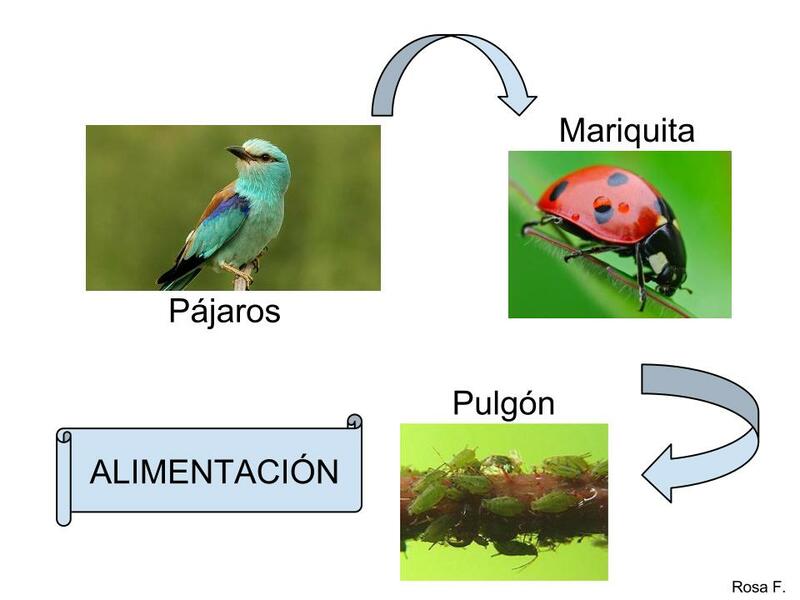 Systemic insecticide with dimethoate in its composition. What you comment is undoubtedly a very interesting topic that deserves an entire article. I’m taking a look at your article, right now. Great post my friend, very interesting indeed. I didn’t actually know that ladybugs were so useful actually. Hi there, Mark and thank you so much! I just searched and read information about it because I did not know about this problem and definitely it seems they themselves are a plague that many countries are trying to control. Thanks for the info; I will research about it deeper. Thanks, @dresden – Ladybirds not just beautiful but a friend in the garden! Ladybugs are our pretty allies. I had no idea lady bugs were so complex…thanks! They’re very helpful and beautiful! Molto interessante, le coccinelle mi sono sempre state simpatiche ma adesso le adoro anche di più, visto che le piante del mio terrazzo sono spesso vittime degli afidi. Well then it is enough to introduce a pair of these in your plants so that the aphids disappear and you have the healthy garden. Lovely ladybugs! They’re the best gardeners. A good choice to love! Heh, heh! Yeah! They are devouring machines! Thanks but pictures are not mine, just my choice to illustrate the entry. Yeah, these suckers have ruined loads of my plants, but they’ve got to live, so I absolve them. I know what you mean; sometimes is a difficult decision to kill the Nature’s creations, in any of all its forms. I’m glad you find this information useful. I really like them. They are considered to bring a good luck, at least to the farmers. Now i know why. Thanks for sharing!